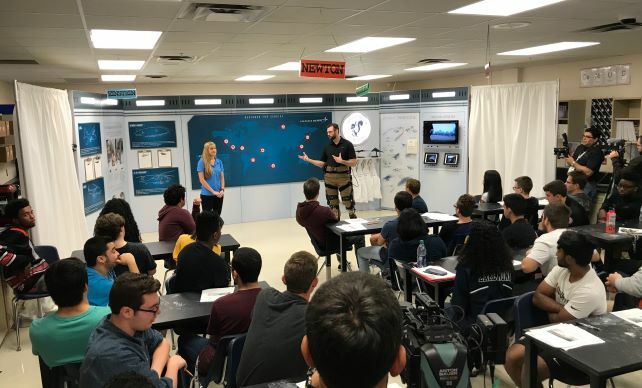 Orlando, Fla., April 4, 2019 – Lockheed Martin and Discovery Education, the leading provider of digital curriculum resources, digital content and professional development for K-12 classrooms, surprised students today at Lake Nona High School with a top-secret STEM mission creating a prototype aircraft that could serve in a humanitarian aid mission. Lockheed Martin also gifted the school with a 3D printer and plan to bring engineers back to the school to assist with training on how to use it. The project, called Designed for Service, is part of a larger program called Generation Beyond. This spring, Generation Beyond will take over high schools in three additional cities nationwide. Lockheed Martin takes pride in its connection with our Central Florida community. With more than 60 years and 8,000 employees, Lockheed Martin’s Orlando employees develop some of the most advanced technology for the nation and our allies. In 2015, Lockheed Martin announced its $2 million investment into Orange County Public Schools to expand STEM programs through Project Lead the Way curriculum. Advancing the STEM workforce pipeline, Lockheed Martin presented $300,000 to Valencia College in November 2018 to support a second advanced manufacturing training program. In February 2019, Lockheed Martin partnered with the University of Central Florida (UCF) to establish a Cyber Innovation Lab. The lab will foster the next generation of cyber talent. Details about Lockheed Martin are available at our website and Orlando page.